Customers moving within California - locally (under 100 miles) can ask movers to load their plants inside the truck. However, movers' main priority is to make sure that shipment fits inside the truck to avoid a second trip. Plants are very delicate, can not stack on top of them - so they take a lot of space inside the truck. 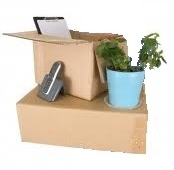 Usually, movers load plants last, after all boxes and other goods safely secured inside the truck. In our experience we have transported (locally) many different sorts of plants, using wardrobe or dish pack boxes. Securing plants safely, and in some cases customers were assigned special trucks just to take care of their valuable plants. Plants seem amenable enough. They barely move and they certainly don't audibly complain about anything. But they're actually very sensitive beings. And they will get as upset as your cat or dog about moving to a new place -- especially when moving involves spending a lot of time in a vehicle that's not temperature controlled. You may not be able to bring the plant at all if it's outlawed in your new area. And if your plant is legal to make the move, you need to keep it moist and make sure the temperature of the vehicle is reasonable. What else should you do to make your plant's trip a comfortable one? Make sure plants are moist when they are packed for moving. They can usually survive for about 10 days without water. So you probably won't need to worry about watering them during the trip. If your plants are in ceramic or clay pots, those are heavy to carry and they're also breakable. So, it's a good idea to transplant your plants to plastic pots before the move. But even just moving them from one pot to another can be traumatic. So do this a couple of weeks before your move. That way the plant will get used to its new pot before it's put on the road. A few weeks before you move assess all your plants you are planning to transport. Prune them, feed them and administer any pest control treatments to get them into peak condition. Think about the pots they’re in – if you’re worried about transporting stone pots, for example, re-pot the plants into plastic ones. Also, take some time to check that all pots are whole and not cracked. A cracked pot stands more chance of breaking in transit and thus damaging the contents. Make sure that the pots are not too big for the actual plant – this can cause them to move about and damage themselves. On your moving day (or the day before if you’re pushed for time) make sure that none of the plants are water-logged and drain away any excess water. Pack them snugly (but not too tightly) into the boxes you have set aside and put some packing in place to hold them firmly. Point out to your movers that these boxes contain plants – although you won’t have any insurance coverage, they will still take a special care of the boxes. Plants in large pots should be wrapped in plastic or placed in bags – you can also wrap the actual plant in plastic to avoid damage and to keep the plant together. If you do this, be careful to make sure that the plastic is not tied together too tightly – they still need to breathe.